Look out Dominique Ansel. The California donut industry is coming for your cronut. The morning began like any other before it. I woke up, performed my morning ablutions, and decided to stop by the neighbourhood donut shop on my way to work. As I had done thousands of times before, I stepped up to the counter to order a few dozen treats for my engineers. But, this morning was different. Behind the familiar glass counter, nestled between the donut holes and the old fashioneds, was something I'd never expected to see. 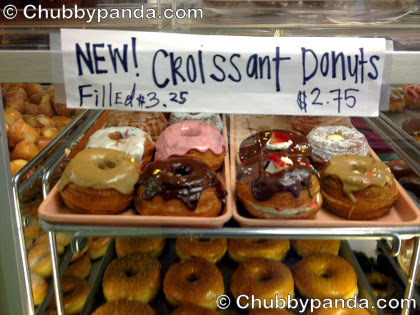 A hand-lettered sign advertising "Croissant Donuts", with two small trays of flaky, golden brown decadence stretching back underneath it. The first bite was a revelation, unlike any other dossant, doissant, or cro-not I'd ever tasted. 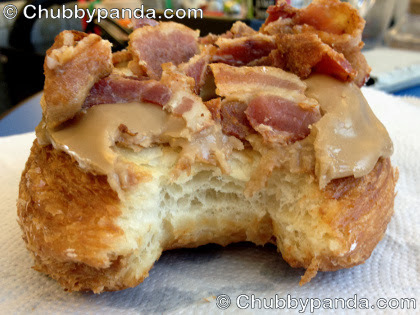 A crisp outer crust that shattered into distinct layers, then melted into a toothsome chew which paired well with the maple icing and generous pieces of bacon. The interior was savoury, not greasy, with just a hint of buttery goodness. 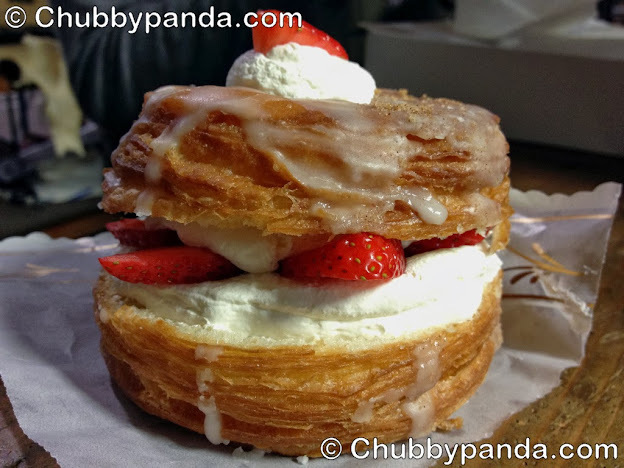 To paraphrase Marshall Eriksen, this was no mere cronut imitator. It felt like God, speaking to me through food. I had to learn more. I had to share this confectionery masterpiece with the world. It was supposed to be a straightforward article. Feature a local mom & pop with an exciting new offering. Talk about their small batch, artisanal products, their focus on quality, and their attention to detail. I'd portray the patriarch as a master craftsman, driven by a passion for his work and struggling for relevance in a world that no longer appreciated him. I'd demonize celebrity chef Dominque Ansel as a lawsuit-happy elitist, always an easy target, and trumpet hip locavore ideals. The story practically wrote itself. The world, however, isn't so easily black and white. I meet with Ning Yen, his wife, Chhen, and his son, Peter, in a small Irvine strip mall. With his fashionable sunglasses, Pillsbury corporate polo, and ever-ringing cell phone, Ning seems more like a successful businessman than the simple baker I'm expecting. Chhen, on the other hand, is a familiar sight. A shy woman with a beautiful smile and an impish sense of humor, she's served me at the counter of Mag's Donut and Bakery for over 14 years, frequently slipping an extra treat into my bag. She met Ning when they were in their teens. He was delivering oranges to Cambodia's capital of Phnom Penh from the family farm in Battambang, where Chhen needed to go. She often jokes to her children, "I hitched a ride with your dad and got stuck with him for life!" Little do I realize that I'm in the presence of donut royalty. Ning Yen is revered as the "Godfather" of the California donut industry. A Chinese-Cambodian refugee, he never finished high school. "They shut the schools down in 1970," he explains to me, "during the Cambodian Civil War." After the family farm was seized in 1975 by the Khmer Rouge, Ning spent four-and-a-half years during the Cambodian Genocide as a forced laborer in the fields before escaping by foot to Thailand with Chhen. The couple ultimately made their way to the US in 1979. They were the lucky ones. Over 50% of Cambodia's 450,000 ethnic Chinese were executed by the Khmer Rouge on suspicion of being foreign subversive elements, part of larger ethnic and socioeconomic cleansings that ultimately claimed 1.7 million lives in four short years. A 21 year-old refugee with a limited education and few marketable skills, Ning benefited from an informal assistance network of Cambodian expats, which he later helped to expand dramatically. He was fortunate to secure a trainee position at a Winchell's Donut House in Santa Ana, and to gain the mentorship of fellow donut legend and Winchell's alumnus, Ted Ngoy. Chhen worked as a seamstress mending clothes. 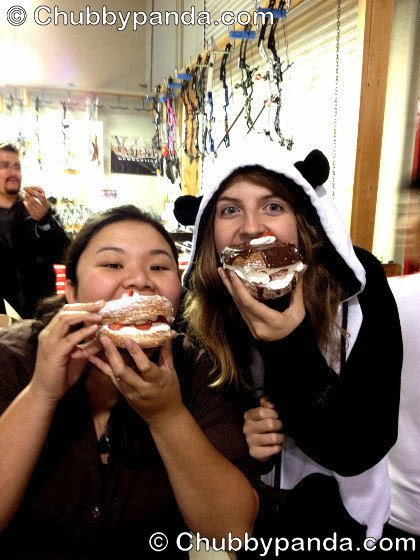 After five years of hard work, Ning and Chhen were able to purchase their own small donut shop in Irvine. 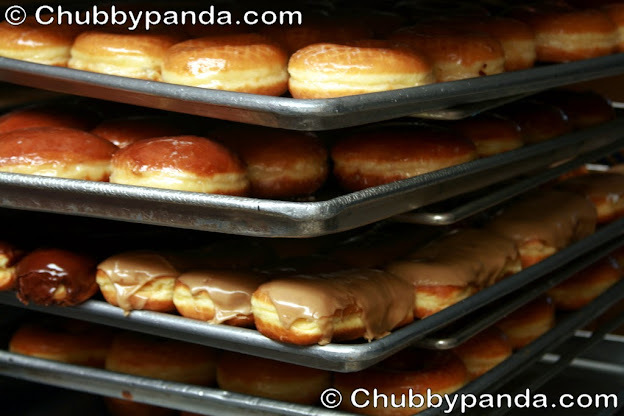 The original Mag's Donut and Bakery has been in continuous operation since 1984. Ning's ambitions weren't limited to one shop. Building on the model taught to him by Ted Ngoy, he helped fellow Cambodian immigrants raise themselves up from poverty. He taught them the donut trade, which required little English or prior culinary experience, and assisted them in establishing their own shops. Ning's rising fortunes enabled him to invest in B&H Distributor, a donut equipment and ingredients provider. By 1995, Ning had assumed controlling interest in B&H, and operated a massive distribution empire supplying equipment and ingredients to over 2,400 Cambodian-owned donut bakeries throughout California, an estimated 80% of the total donut shops in the state. However, a combination of economic recession, the Krispy Kreme fad, and the rise of boutique coffee chains in the early 2000s ultimately gutted the market. He sold his shares of B&H Distributor in 2003. These days, Ning likes to keep things simple. 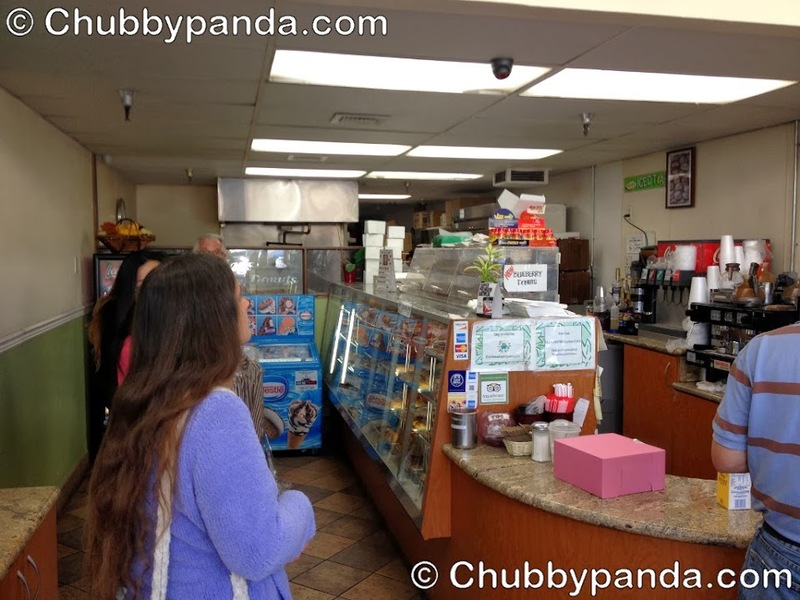 He owns only one store, Mag's Donut and Bakery in Irvine, for which Chhen has taken over day-to-day operations. His son, Peter, and daughter, Moon, run Santa Ana Packaging for their father, which manufactures bakery-related packing materials and supplies distributors. If you order a box of donuts from any California donut bakery, chances are they'll be handed to you in a Santa Ana Packaging product. For Ning, it's all about interesting projects now. He consults for a number of companies in the baking and baking supply industry, leveraging his decades of experience to help them create appealing products. 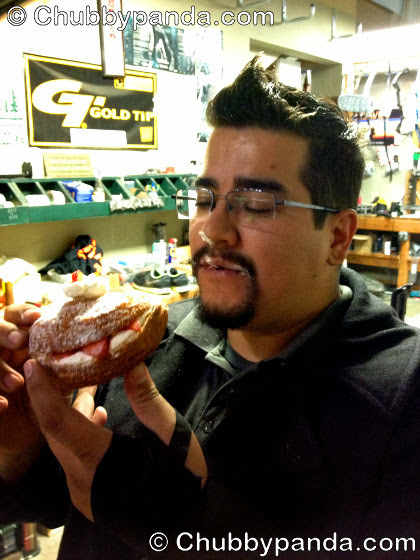 Which brings us to his latest project - the Croissant Donut. 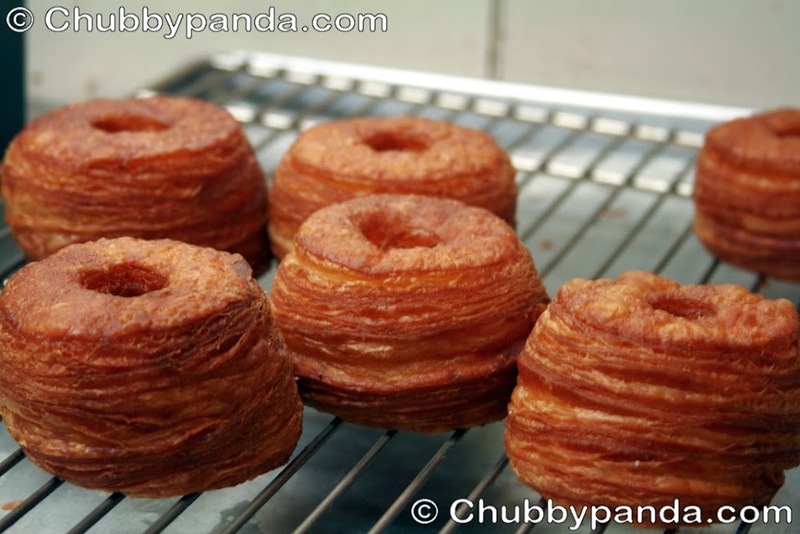 Dominique Ansel's cronut is an engineering marvel. From a food science perspective, not only does it not make sense, it inconceivably violates a number of basic culinary rules. Frying requires the use of a protective barrier, such as batter or breading, to protect an interior ingredient. As the food cooks, the evaporating water vapor pushing outwards prevents fryer oil from rushing inwards. Without moist contents, or an impermeable membrane, fried food can easily become a grease-laden, artery-clogging disaster. 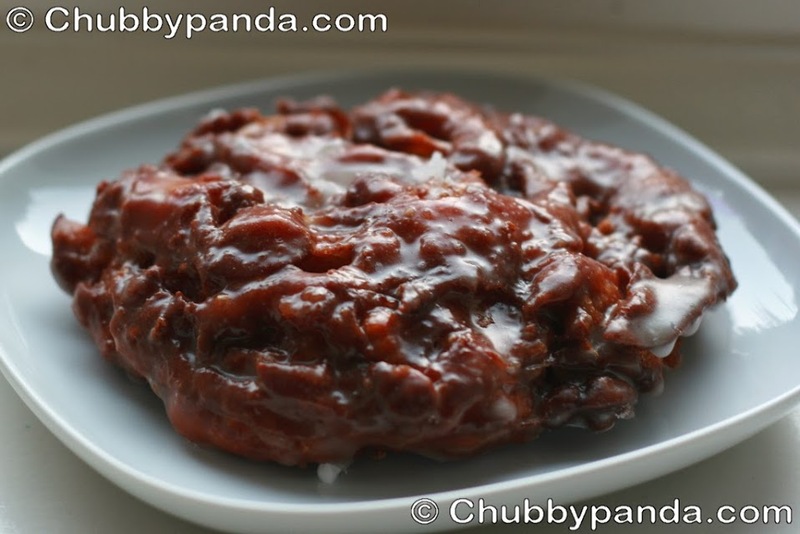 With traditional yeast or cake donuts, a thin outer layer cooks instantly to form a protective barrier, while escaping water in the dough or batter prevents more oil from penetrating. 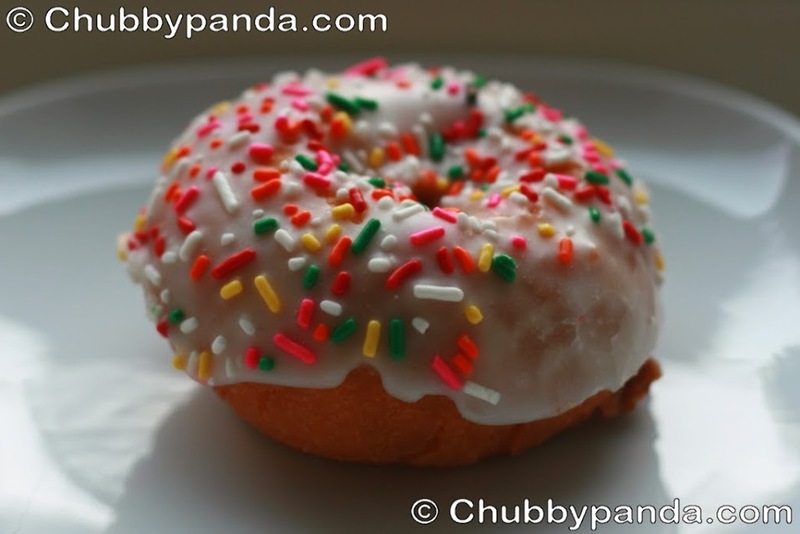 If you've ever had a greasy donut, it was fried for too long, or at too low of a temperature, allowing the oil to seep in. Croissant dough, with its numerous, alternating strata of gluten and fat, is far from ideal for frying. When baked, butter or margarine keeps the layers of dough separate and flakey as they set. 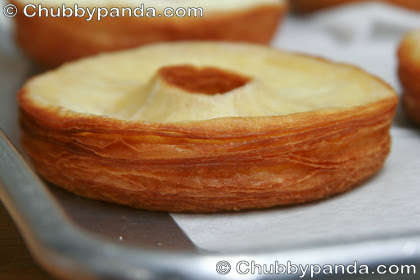 Unfortunately, the fat necessary for giving a croissant its texture is also what ruins croissant dough when fried. Water and fat don't mix, which is why evaporating moisture during frying keeps fryer grease from entering the food. However, since croissant dough is relatively low in moisture, it runs out of fat-repelling water before being fully cooked. At that point, the butter or margarine riddling the dough, which mixes very nicely with other fats, will help draw more fryer oil in. The aspiring cronut imitator can too easily end up with a gut-busting crouton soaked in grease. To conquer this challenge, a baker needs to strike the perfect balance between water, gluten, and fat, creating a light and airy dough that doesn't run out of moisture before it's fully cooked, yet still separates into distinct, flakey layers. If you're a genius like Dominique Ansel, you sidestep the fat portion of this scientific conundrum and develop "a laminated dough which has been likened to a croissant." 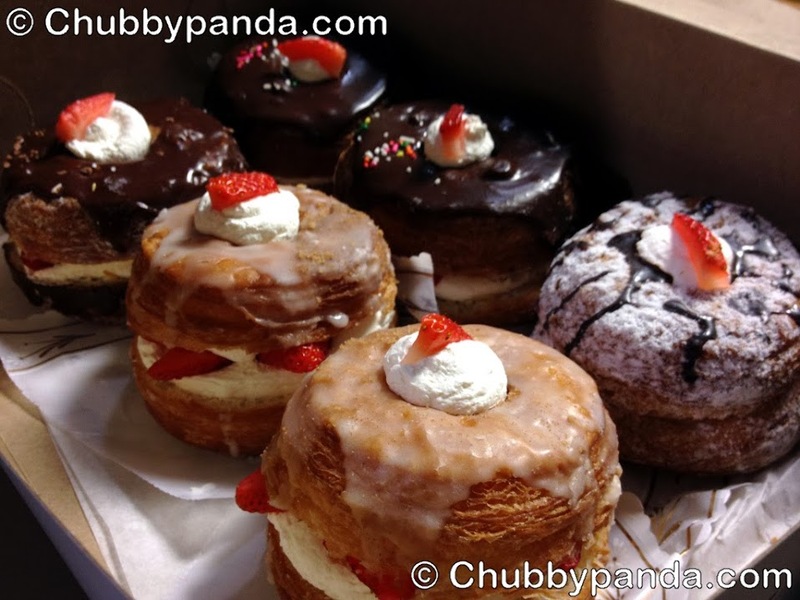 His cronuts, hand-produced in small batches, are justifiably famous; the epitome of the baker's art. However, not everyone can afford to hop a plane to New York City in order to wait hours in line for a chance to buy one. Given the foodie buzz around cronuts, and Dominique Ansel's firm, some might say mad, resistance to manufacturing and distributing cronuts on a mass scale, is it any wonder that cronut imitators abound? Despite Ansel's egalitarian policies regarding cronut sales (he and his staff are renowned for denying celebrities preferential treatment), its exclusivity and luxuriousness inspires lust. From Houston supermarkets to Dunkin' Donuts in the Philippines and South Korea, you can find pastries inspired by Ansel's masterpiece springing up around the world. Even Pillsbury has gotten in on the act with an online recipe for "crescent donuts" using their pre-packaged grocery store dough. In spite of his best efforts to stay local, Ansel has found himself at the forefront of a global donut revolution. 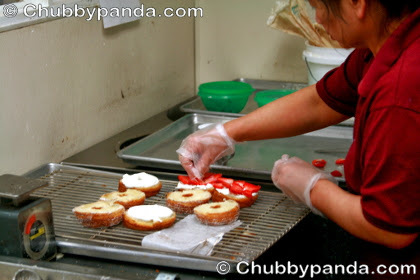 In the small kitchen back at Mag's Donut and Bakery, Ning cuts a wedges from two fresh batches of Croissant Donuts. "Here, try these," he says as he hands them to me. "I want you to taste them plain." "This one is crispier," I reply, pointing to the batch on the right. "But I like the other one better. It's doesn't taste as greasy and has a better mouthfeel." The Yen family beams at me. I've selected yesterday's dough formula and confirmed their opinions of it. Next is a lemon custard created by Peter's girlfriend, Sandy. Ning spreads it on a split Croissant Donut, cuts it into pieces, and passes them around. As we sample, we discuss the flavor, sweetness, texture, and mouthfeel of the new filling candidate. Since the beginning of November, Mag's Donut and Bakery has been ground zero for testing a new, commercially manufactured Croissant Donut dough. Ning is essentially consulting on the project pro bono for a friend, helping him to develop a product specifically formulated to make high quality Croissant Donuts for mass distribution to donut bakeries. Every day, the Yens try a new formulation of the dough, which has been altered to reflect feedback from the family and their customers. It's an exacting process, Ning explains. The dough is prepared, proofed, weighed, fried, and then weighed again to make sure as little oil as possible has been absorbed. 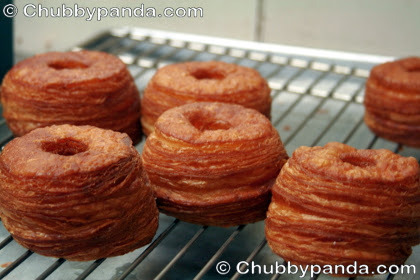 The day's batch of Croissant Donuts are then dissected to check for oil penetration, crispiness of the crust, separation of the layers, and chew. After that, they're tested with various glazes and fillings to evaluate the overall effect. This level of precision is deeply ingrained in Ning. He is, despite his background as a baking industry tycoon, an experienced master craftsman in the fine art of donut making. 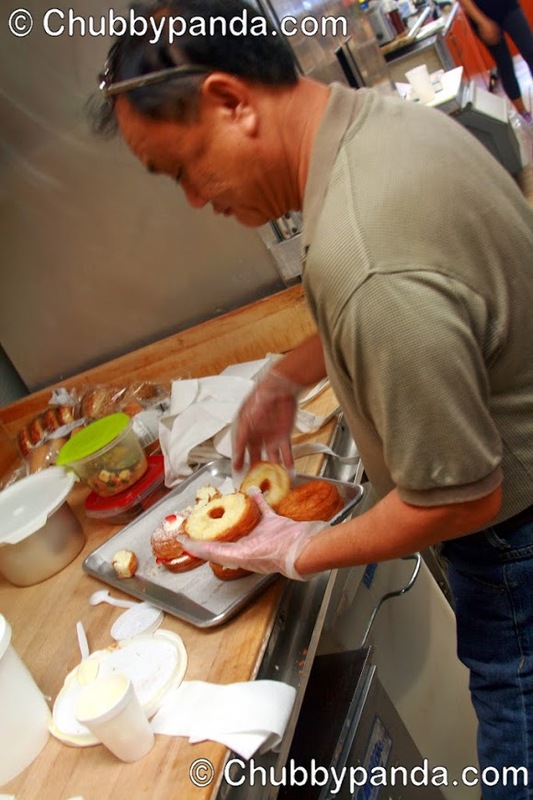 Peter estimates that 85-90% of donut shops use manufactured doughs and mixes from one of several major distributors, including Mag's Donut and Bakery. 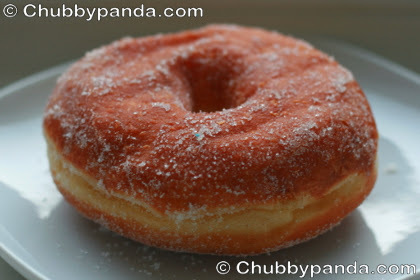 Yet their donuts are, and have been for the fourteen years I've been a loyal customer, the best I've ever had. Accept no substitutes. Moist and delicate, their cake donuts provide just the right amount of resistance before yielding a fluffy interior that fills the mouth with inviting richness. I'll take them plain. They're that good. 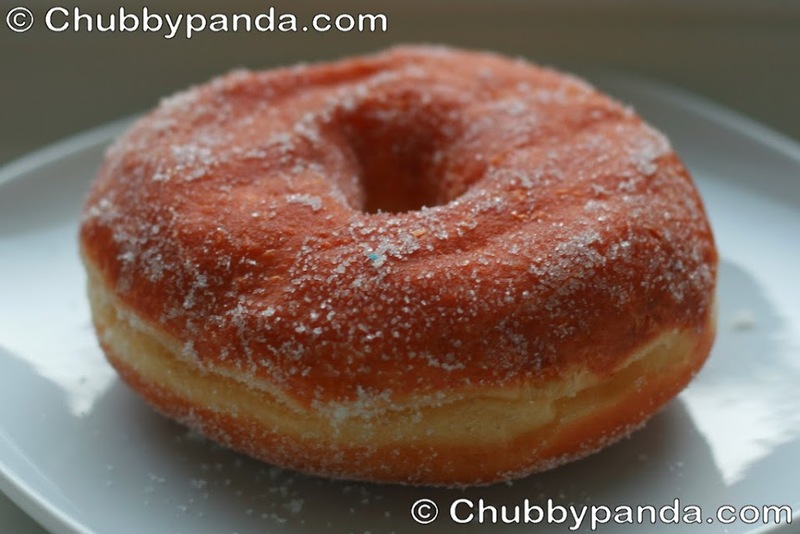 The yeast donuts are light, airy masterpieces with just the right amount of chewiness to balance a skillfully proportioned glaze. The sugar in their doughs and batters are strictly controlled to temper the sweetness from the icing. With decades of experience, Mag's produces superior products using the same equipment and ingredients as a number of their competitors. 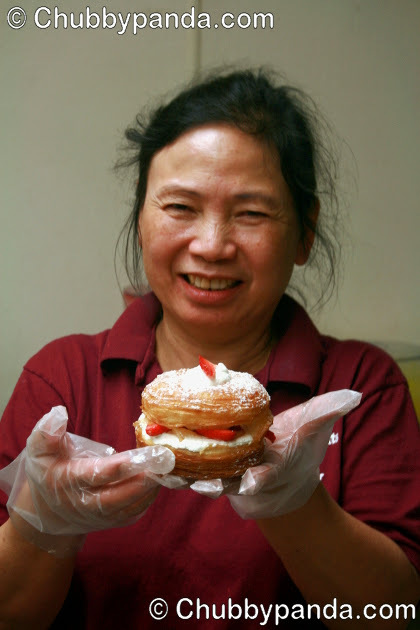 The key difference lies in Ning's deep understanding of the donut-making process, and in Chhen's natural culinary and artistic ability. Each of Chhen's croissant donuts are almost too pretty to eat. For the Yen family, fulfilling the need for a new product created by the cronut craze is a way to revitalize the flagging industry Ning once played such a major role in, and to elevate a blue-collar American birthright that's commonly viewed as a stodgy. "Donuts are a low traffic, high margin business," Ning tells me. But, the customers aren't coming like they used to. Not to Mag's, or to any other donut bakery. Already flagging before the Krispy Kreme collapse in 2004, the tastes of younger consumers have moved on to other fads. "I used to have three coffee brewer machines running," he continues, waving towards the only one left in the shop. "In the morning, non-stop. People would line up from here through the door. A lot of people go [to] Starbucks, you know. The younger generation. ... We never promoted the coffee before. We always promoted the donuts. So now, [our] coffee business, it's kind of slowed down. … " When I suggest partnering with a local artisan roaster, such as the Portola Coffee Lab, Ning shakes his head. "It doesn't matter. They just want the name. People want the name." "My sister and I, we've always wanted to try out new things," Peter says. 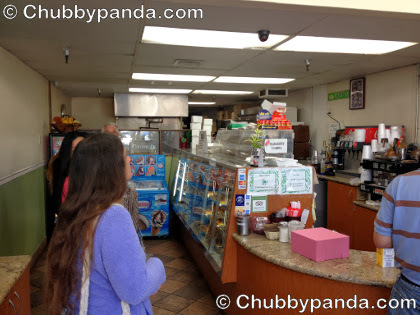 He sees the Croissant Donut as a way to make donut shops interesting again for his generation, and to reflect the change in Irvine's demographics over the past three decades. While predominantly French inspired, the Yens draw from Irvine's other culinary cultures when testing new flavors, including Asia and the Middle East. The strategy appears to be working. As word about Mag's new offering has spread, their clientele has expanded. "My [regular] customers told [Chhen], ‘Wow. Right now [we feel like] we have to ... wear a tie and suit. ... Because right now [we see] a lot of people wearing ties and suits coming to your store,'" Ning adds. Office workers are not a core portion of Mag's client base. According to Chhen, "Usually it's teenagers, 18 [to] 21, UC Irvine [students]. But now, all the kids, they want it too." Children as young as 12 have started to stop by the store for the Croissant Donut, and the family has noticed a spike in office workers in their 20s and 30s stopping by Mag's in the evenings, something the Yens have never seen before. "I think that's the market we want to hit," Peter concludes. The original Mag's Donut and Bakery in Irvine - A 30 year-old piece of culinary history and an Irvine institution. This is not your ordinary donut shop. Come for the Croissant Donuts if you must, but try their coffee and some of their other expertly crafted offerings. Sample a piece of donut history. The Irvine location is the only one offering Ning Yen's croissant donut. 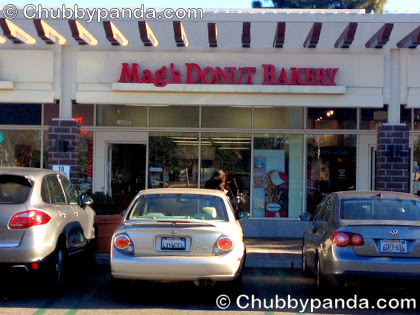 The Mag's Donut and Bakery locations in Newport Beach and Costa Mesa are owned by Ning's friend, Chong Yam, and Chong's niece. 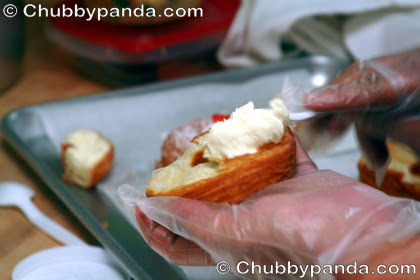 Ning helped Chong set up the bakeries when he was running B&H Distributor. (This article is dedicated to the Yen family. Many thanks to Ning, Chhen, Peter, Moon, and Sun for their participation and assistance. Additional thanks to Sandy Ho. 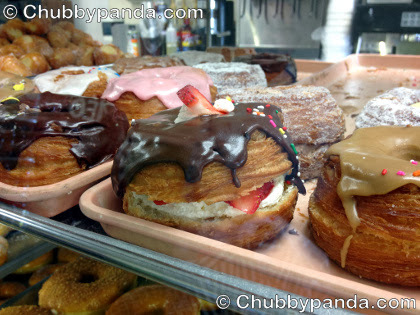 Read about the history of LA's pink donut box, and the Yen's history in it, here. Wow, you're alive! Welcome back CP! I've never heard of this place but would love to try it now! Your post was really insightful about the donuts! yes, wow! that is amazing and I wish they had a location up here! I can't pass up an apple fritter either, but dang I hope they get their dough perfected and shipped up my way one day! What an excellent post! liked how you went into the background/history of the owner and his role in the donut industry. Very good to know! I went here last year trying to get one of their blueberry donuts but they had run out. Will have to stop by on a future food road trip!